As mentioned in my last blog post, this Saturday (the 28th of November) saw the release of the new book from KnightWatch Press, "New Tales of the Old Ones". I hadn't contributed to this particular collection, but as I've joined the KnightWatch fold through two releases in 2016 ("A Thousand Tiny Knives" and "Weird Ales: Last Orders") I came along to contribute. If you haven't been to Southcart books, you really should correct that. I'm a sucker for bookshops, especially second hand ones, and Southcart is a particularly good one, spanning the epic hemispheres of both new and used*:). It was my first visit to Wallsall, let alone Southcart books, but Scott and Amy Carter (the owners) put on a fantastic day. Lots of wine and nibbles for all visitors. A dab of red wine may have been had before I had to read my own piece. As you've probably guessed from the title of the event, it was - as well as an event to release the new book - a celebration of Lovecraft and his works. I got to meet my editor Theresa Derwin at last, as well a number of other excellent authors. It was an excellent day. 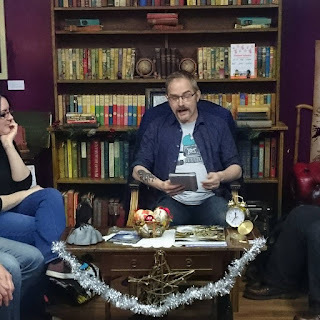 We heard about Great Cthulhu's online dating attempts and the Damp Ones respectively from Jonathan Butcher and Chris Amies, and an except from the new book from Michael Brush. There was a fascinating biographical piece about Lovecraft and Astronomy from A. Stuart Williams (who also read his story from the aforementioned anthology), and a great reading from Richard Bruce Clay. Not to mention some wonderful musical accompaniment by the supremely talented Jessica Law. Some fantastic talents all crammed into a wonderful reading room! I'd - as per usual - completely misunderstood the brief, but had luckily confirmed with Theresa about a week before that I needed to have an original story. I had a few stories that were could have tenuously linked to the Mythos, but none that could do it justice. I had the basis of an idea that I spent a few days writing into a piece that would take about 20 minutes to read, and to my relief, it went down well. I'm still nervous about public speaking, and this is one of the few pieces I've read that didn't feel uncomfortable - after a while where it was obvious the audience were enjoying it, I started enjoying it too - and that's a first! So, all in all, an excellent day. Lovely to put some faces to names of people whose works I've read, and nice to be a part of such a special day with such a great group of people. There may have been drinks imbimbed once the event finished, but that's a story (and a blackmail attempt) for another day. ALSO: "Caped", the superhero anthology that I've contributed towards - and mentioned in my last blog post - is now available to buy. Is it a bird? Is it a plane? Are you absolutely positive it isn't a bird? Firstly, I'm pleased to announce that "Caped" (a superhero themed anthology collection from Local Hero Press which contains my story "Sovereign's Last Hurrah") is now available to pre-order. And Introducing the Scarlet Scrapper by Leonard Apa: A Golden Age tale of an actor who hates playing a superhero on the radio but discovers a new role awaiting him. Sovereign’s Last Hurrah by David Court: In a retirement home, elderly supervillains scheme to return an item of power to their greatest enemy. RIGHTMAN! Loses the Faith by Gary Cuba: Being a superhero is what you make of it, and what you can make from it. Dax and the Red Eyes by Adrienne Dellwo: Dax's disability prevents him from telling anyone about his brother using powers to hurt people. Dum Dum by Leod D. Fitz: Some supervillains are geniuses, and others are simply well-trained. Light Therapy by Che Gilson: Being a sidekick is a thankless job. Pinning Portugal by Elliotte Rusty Harold: A group of supervillains hatches a new scheme that naturally goes awry. When Fukayna Danced Her Libraries by Jake Johnson: Eventually even superheroes need to step away from the job. Super Frenemies by Stephen Kotowych: A group of super-powered children take on the neighborhood bully with surprising results. The Faces of the Wind by Laura Lamoreaux: After World War II, the country no longer needed superheroes, leaving the heroes with difficult decisions. Capacity Crowds by Paul McMahon: He wants to be a real superhero, but can't seem to find a villain to match him. Heart of the Matter by Robert J. Mendenhall: Cameron's powers are preventing the medical treatment that may save his life. Ebony Boneshaft, Secret Superhero by Wendy Qualls: She didn't mean to discover Ebony Boneshaft's secret identity, and when she did, it caused no end of trouble for her. Eye of the Beholder by Dave Ring: Being seen as the object of everyone's desire is a poor way to live life. I Am Hathor by Aaron Michael Ritchey & Jason Henry Evans: Balancing superheroics and motherhood is a difficult dance for Hathor. The Romulus Proposition by Tim Rohr: When the mighty have fallen, it's probably because they were pushed. Saul, Again by Eric Rosenfield: A time traveler takes a circuitous, long-term approach to facing a dangerous villain. Damn the Dark, Damn the Light by K. H. Vaughan: There's a fine line between heroism and nihilism and sooner or later everyone crosses it. 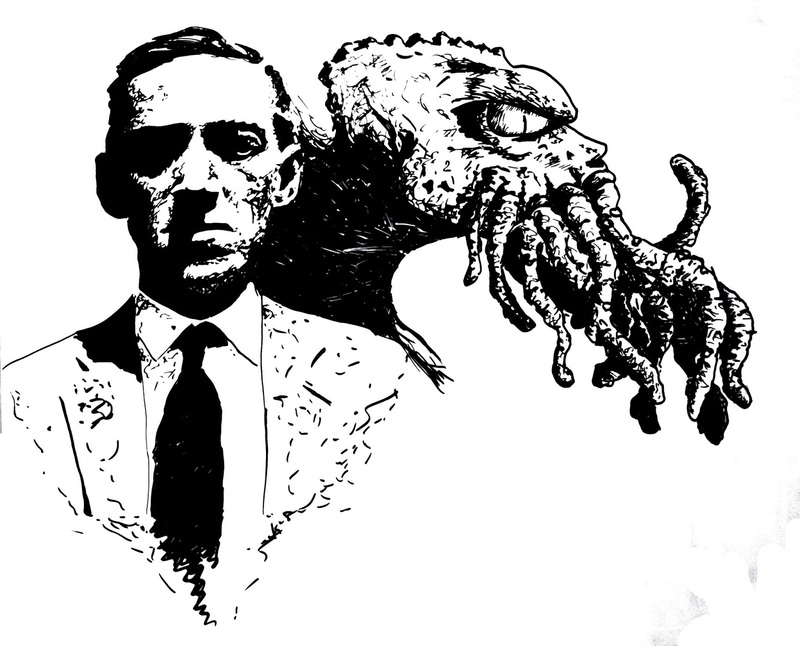 Secondly, some more details on the Cthulhu Calling day mentioned in the last blog post on here. 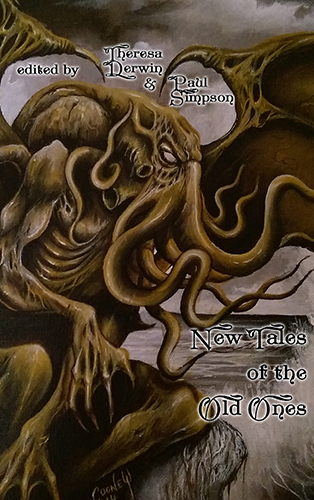 KnightWatch press are releasing their Cthulhu themed anthology "New Tales of the Old Ones", and a selection of writers and artists will be attending Southcart books on Saturday the 28th of November. (I don't have a story in the anthology, but will hanging around like a Banquo at the banquet). 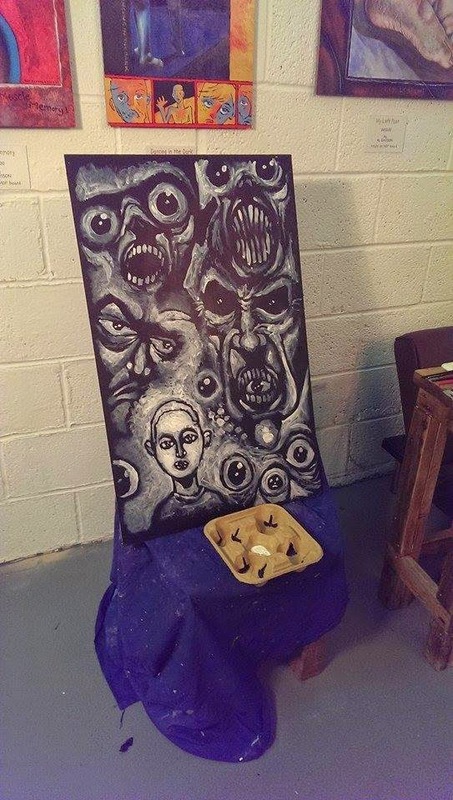 A selection of authors (myself included) will be reading from Lovecraftian themed works, whilst artists show off their various squamous tentacled wares. 10:30 - 11:00 Browse and Buy! 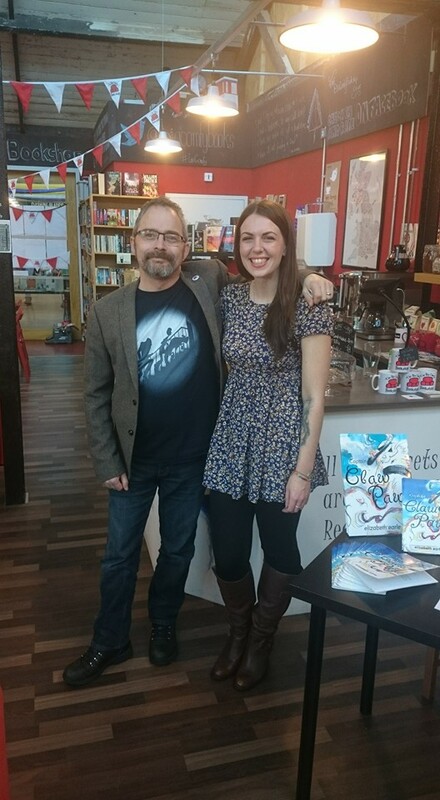 And finally, just a shout out to my fellow author Elizabeth Earle, who I've mentioned before on this blog - We first became friends almost a year ago to the day at a book signing at The Big Comfy Bookshop in Fargo Village, Coventry. She's just released an excellent kids book - "The Adventures of Captain Claw Paw" (the adventures of a Pirate Cat and his motley crew) which was released this weekend. 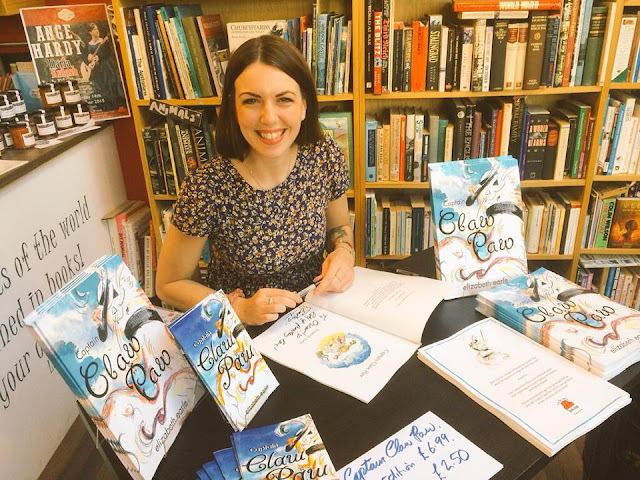 Profits from it are going to an excellent cause in Charlie's Beach Hut, Elizabeth both wrote and illustrated it, and it's thoroughly charming. Grab your copy from The Big Comfy Bookshop or online from here. It's a great kids book, an incredibly worthy cause, and I wish it all the success in the world. I was lucky enough to see the work in progress as this book was being completed, and the final result is better than I could have imagined. As it's been a long while since I've updated this because I've either been poorly or doing some actual writing and stuff, I thought I'd bring you up to speed with regards to what I've been working on over the past couple of months. That, and the blog is starting to atrophy through disuse. Along with tidying up some scripts for Twisted Dark (and Twisted Sci-fi), I've also been working on the early stages of a Super Special Secret Project™ with the incredibly talented Simon Myers (of Pretty Funky fame) - it's very much in the thrashing out ideas stage at the moment, but we're bouncing some really good stuff off each other and I think it's going to be pretty damn special. The title for it is now officially "Scenes of Mild Peril", and it's a collection of 24 brand new stories (and a couple of poems thrown in as well after a few people moaned about their omission in FAEA). It's considerably bigger than the previous two books, because I've enjoyed crafting some longer stories in this one. I'm really pleased with it. Not Actual Size. Contents may settle during transit. The photograph that accompanies this piece is merely a work in progress. Although it's still early days yet, I'm anticipating that the finished article will resemble an actual book (with all the usual gubbins of a cover, pages and a spine) as opposed to a promotional stress-relief toy in the shape of a van with "Scenes of Mild Peril" crudely scrawled on the top with a promotional ballpoint pen. It's in the proof-reading and cover design stage at the moment, but I'm hoping to get it released by the end of September 2015 at the very latest. More information as I have it as we draw nearer to the release date. 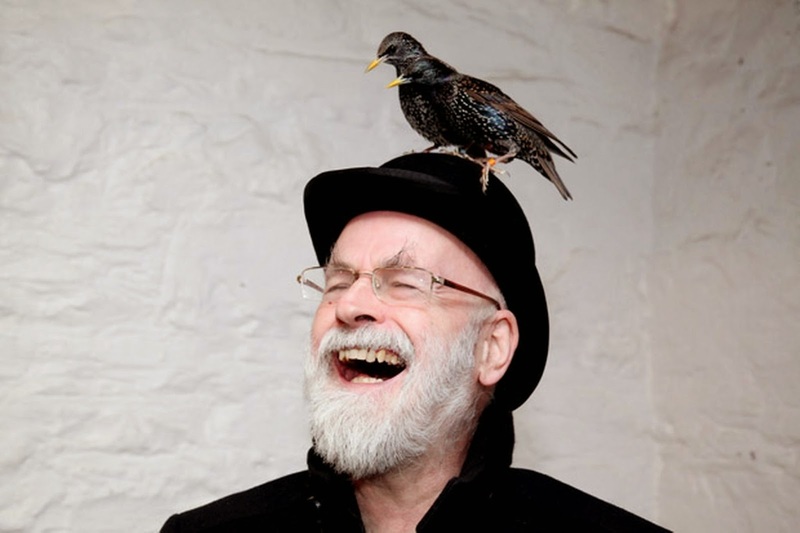 Whilst I've got your attention, I urge you to look to the right and have a gander at the "Books, Films and Random Lunacy" link that's hovering there. It's written by my very good friend George Bastow, who is a fellow Midlander, a young talent of some repute and a real name to watch out for. Well worth a few moments of your time. 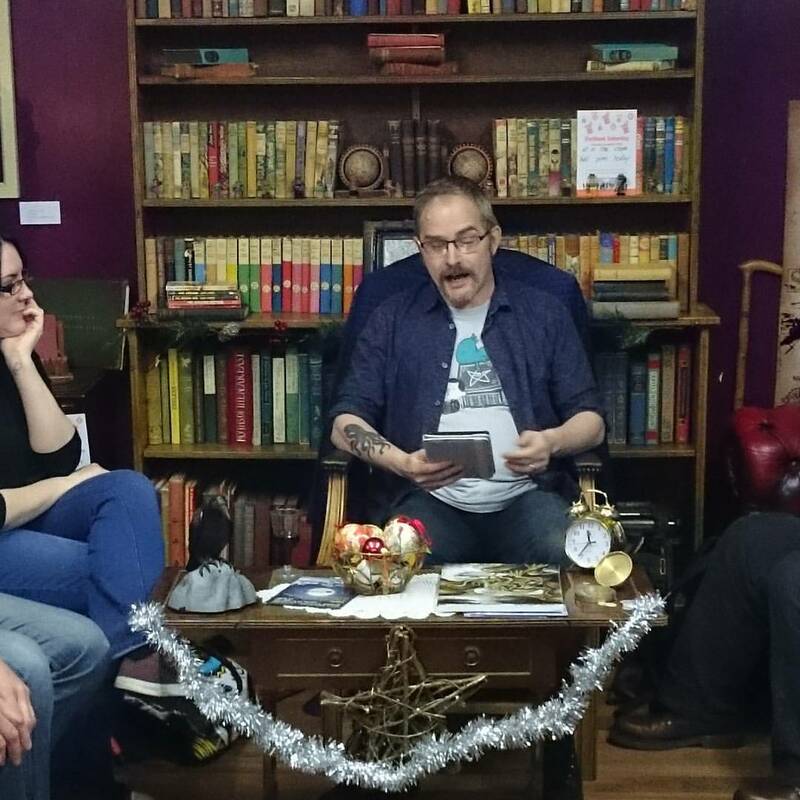 There's also an interview floating around online - namely here - that I did for another local author Daniel Burton as part of his Journalism and Media module for Coventry University.